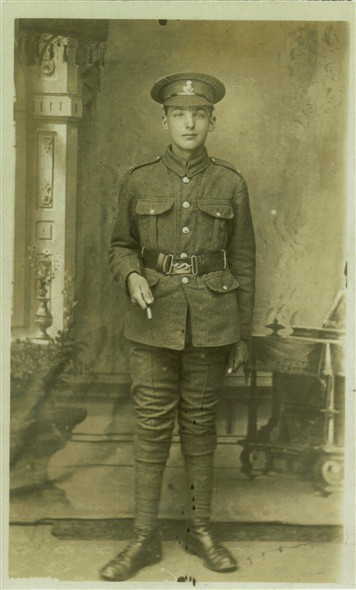 Private Sydney Garnet Robinson, photographed after enlisting. Sidney Robinson is one of the men whose name is on the Bottesford ‘church list’ of WW1 Servicemen. His name is sometimes recorded as Sydney and at other times Sidney. Sydney Garnet Robinson was born on the 15th June, 1898, in Easthorpe and baptised in Bottesford on the 10th July that same year (Lee family tree, Ancestry website). His parents were Thomas William Robinson, born in 1873 in Easton, Yorkshire, and Sarah Turner, born in 1876 in Swinstead, Lincolnshire. He was the oldest of eight children. His siblings were Winifred (born 1901), Herbert (b.1902), Bernard (b.1904), Marjorie (b.1908), Stanley (b.1910), Ernest (b.1912) and Freda (b.1914). According to the 1901 census the family lived at 7 Muston Road and his father Thomas Robinson was a signal lamp-man. In the 1911 census, when they lived in Normanton, Bottesford, Thomas Robinson was still a railway signal lamp-man, working for the GNR, and eleven years old Sydney was at school. Later, Sydney went to work as a telegraph boy for the GNR, then, according to railway employment records, he started work for the London and North Eastern Railway on the 29th June, 1914, when he was sixteen. Unfortunately Sydney Robinson’s service record has not been found and could have been among those destroyed in WW2. His service with the Durham Light Infantry was reported at his golden wedding celebration in 1971 (Grantham Journal, 31st December 1971) and in his obituary in 1976 (Grantham Journal, 26th November 1976). In addition, his Medal Index Card confirms his Service Number as 201350 and that his units were the 1/7th Battalion, Durham Light Infantry, and 20th Battalion, Durham Light Infantry. 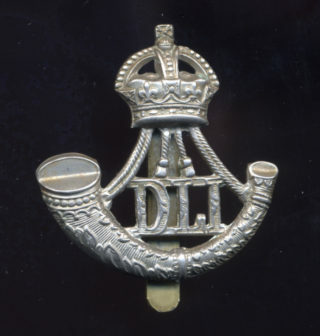 The 1/7th Bn DLI was part of the 151st Brigade of the 50th (Northumberland) Division, which fought on the Western Front. The Forces War Records website confirms his rank as that of Private. The 20th Bn DLI, also known as the “Wearside Pals”, was raised in Sunderland in 1915. In November 1917, it served in Italy as part of the 123rd Brigade, 41st Division, to support the Italian resistance following the disaster at the battle of Caporetto. Stationed at Locon Plage they saw active service on the river Piave and the Asiago plateau before moving to the Mantua area, but were withdrawn in March 1918 to serve in Flanders. In March 1918, they returned to France at Doullens and in the same month were transferred to the 124th Brigade of the same Division. They then saw active service at the Battle of St Quentin, the Battle of Bapaume, the Battle of Arras, the Battles of the Lys and the advance in Flanders, the 3rd Battle of Ypres, the Battle of Courtrai and the action of Ooteghem. The 20th ended the war west of Nederbrakel, Belgium (Information provided by the Forces War Records website and the Western Front Association). According to the golden wedding report (Grantham Journal, 1971), Sydney was wounded on the Somme in 1918, however it has not been possible to identify when this occurred or in which of the many battles. No pension record has been found. He was awarded the British War Medal and Victory Medal. After 1918, Sydney continued working for the railways at Bottesford station. Sydney Robinson was married in December 1921 to Eva May Leese, in Basford. They lived in the villa, Normanton and had 5 children – Stan, Sid, Ivan, Richard and Patricia. In 1939, he was working in the Belvoir signal box, earning £2.15s per week, working alongside his younger brother Stanley. Following his retirement from the railway, Sydney became the village postman for Normanton. Sydney and Eva May celebrated 50 years of marriage in 1971 when Sidney was 73. Sydney died on the 11th November, 1976, aged 78, at The Villa, Normanton. The National Probate Calendar records that he left an estate worth £9.150. He is buried in St. Mary’s churchyard. His wife Eva May died, aged 90, on the 29th September, 1993, also at The Villa, Normanton.